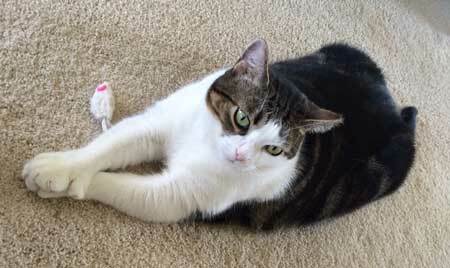 Jessica was adopted in October 2011 by Nancy, who writes, "She is a small kitty with double paws....and such a love. Jessica is not one to be held nor sit on your lap but shows her love in other ways by a constant need for attention. She loves to be petted and brushed. She sleeps by my side at night. Oh and what a beautiful voice! She has settled in quite nicely with the other "kids". Her special morning routine is to "help" me with my jewelry on work mornings. She jumps on the dresser and adds her "help" with head butts and requires petting (loves) from me as I put my earrings and watch on to complete my outfit for the day. Jessica has quite the selection of toys. Her favorite is the round donut shaped toy with the ball inside that she will bat and push around on the inside. Jessica is the love of my life as are all my "kids".....Joshua, Jennifer and Jeremy!" 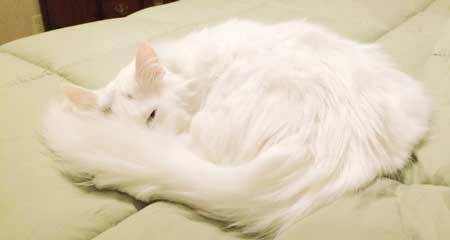 Casper was adopted by RIchard, who writes, " We adopted this big lug several years ago from Kitty Angels. He's been a really good companion for our other two KA kitties. Pamela and Fremont. Here he is, doing what he does best, at our summer home in the NH lakes region. He's just a big 18 pound wuss who's recently decided it's O.K. to be a lap cat. " 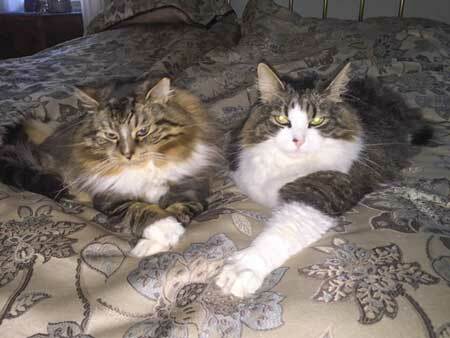 Colleen writes, "Angel & Mojo - Now six and five years years old respectively. Now living the life in Florida with a big enclosed outside pool area to frolic in. Best buddies - most of the time unless the younger whipper snapper thinks he can get away with something - not!" 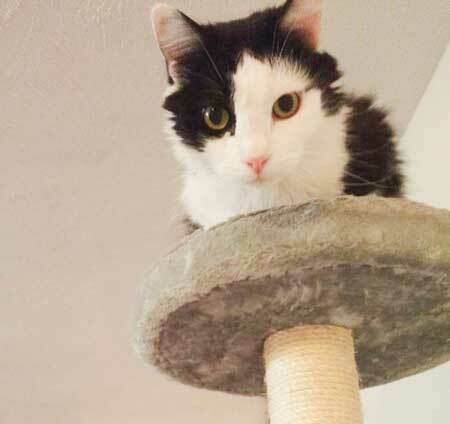 Kali sent us this update on Nobu: "His new name is Shinobu Yoshinori, or Nobu for short. In Japanese, his first name means purity and belief, while his middle names virtuous. He is full of personality: he loves to dash around the house after his toy mice, is very vocal, and enjoys cuddling with us. We have so much love for this boy! He gets along quite well with his older sister, an almost seven year old dilute calico. He's brought happiness into her life after the many difficulties she's endured. They lay together often, and she even lets him lick her (something she's never allowed other cats to do!). He loves catnip, playing with toys, and watching out the windows. He likes playing in the middle of the night, and after tiring himself out he sleeps with us in bed. His first Christmas with us was filled with fun and laughter, as he played with every toy in turn, ate his new treats, and took a long nap. He's such a charming, loving, playful, and kind boy--we couldn't be happier with him and are so grateful he is with us in his furever home. Thank you Kitty Angels for bringing us together!"